Doggy doors are a must-have for pet lovers who want an inclusive home for their pets. These specialized doors allow cats and dogs to wander in and out of the house independently. These save much time and effort in the part of the owners, especially when the pets need to go out to heed the call of nature. However, despite all the help doggy doors offer, they also create access to intruders and unidentified animals into the house. 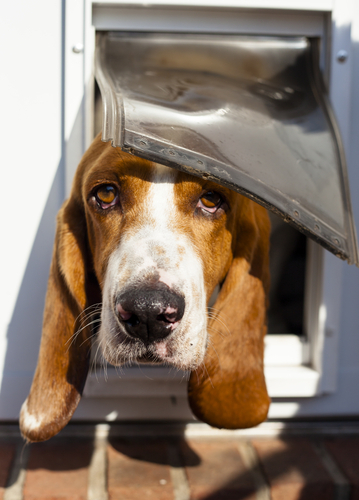 Recheck the promised safety of the doggy door you have installed. Traditional doggy doors consist only of the main board that swings back and forth and frames that attach the pet door to the main entrance. As an innovation, modern pet doors nowadays feature sophisticated lock systems that secure both the main door and the pet door. If you already have a doggy door installed and you are not satisfied with its capability vis-a-vis security, you may opt to fix some add-ons or purchase a new one. Install a doggy door that can fit only your pet. Pet doors vary in sizes. Too big of a pet door can only give an opportunity for burglars or bigger animals from outside to enter. Having the exact size ensures that no dangerous animal of a bigger size can go through the small door. 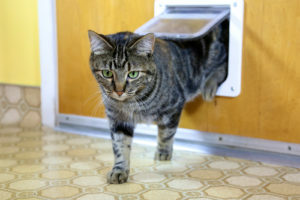 The height of the pet door must equal the height of your pet’s back, and the width must be enough for your pet’s shoulder to squeeze through comfortably. Ensure the safety of the interior lock of the door. Sometimes, thieves utilize the doggy doors to reach the interior lock and unlock the main entrance from the inside. Maintain the height of the central door lock in a way that it’s not reachable from the outside through the doggy door. If possible, use a multilock system that can be composed of the combination of a doorknob lock, barrel lock, and chain lock. Sometimes, pet owners advise not to install a doggy door on a doo itself but on a wall instead for bolts to be out of reach. Keep valuables away from the rooms that can be accessed through doggy doors. Door locks can only do so much in securing your home. In worst-case scenarios, burglars can insert long sticks into doggy doors to get valuable items inside. To prevent theft or destruction of your valuable properties when humans or animals break into your house, properly store your important belongings such as laptops, cell phones, and expensive items instead of leaving them unnoticed in common areas. Safekeep them in your closet or vault in the bedroom when not in use. 5. Enhance the privacy of your home. A home that is very accessible to the sight of people from the outside is prone to theft and invasion. Having this weakness would capacitate onlookers to realize the vulnerability of your locks, access points, and valuables. Installing curtains or blinds in your windows may help conceal your belongings, security systems, and more so your private life from the eye of the public, keeping your private possessions out of others’ attention. Make use of other security systems. Security cameras. You cannot monitor all the entrance to your house 24/7. This is where CCTV cameras come in handy. All the possible ways of entry indoors can be the subject of the cameras while you watch and rewatch the footages from your bedroom or mobile phone. Sound alarms. During nighttime while you sleep, some people may enter your house by force. Good thing there are audio alarms that create loud noises whenever a person attempts to break in. Emergency lights. Usually, burglars come at nighttime to prevent themselves from being seen when they commit their crimes. Emergency lights, when installed, can emit bright lights whenever unwanted people are walking within a particular radius from where the lights are strategically located. The illumination can quickly catch your neighbors’ attention, and they can check out if someone is attempting to enter your house forcibly. Neighbors can also add security to your home. Whenever you would take your pets for a morning walk or visit the vet, you may ask the people next door to keep an eye on your house. This way, they can apprehend those who have the intent to break into your home. The thought of a home invasion can indeed be alarming, much worse if you discover that the burglars utilized your beloved pet’s entrance as their way in. Keeping your home away from the radars of intruders can be an easy task if you know how to properly care for your possessions and your family, including your pets. Apply these tips to keep your house safe, not only for your family but also for your animal buddies.